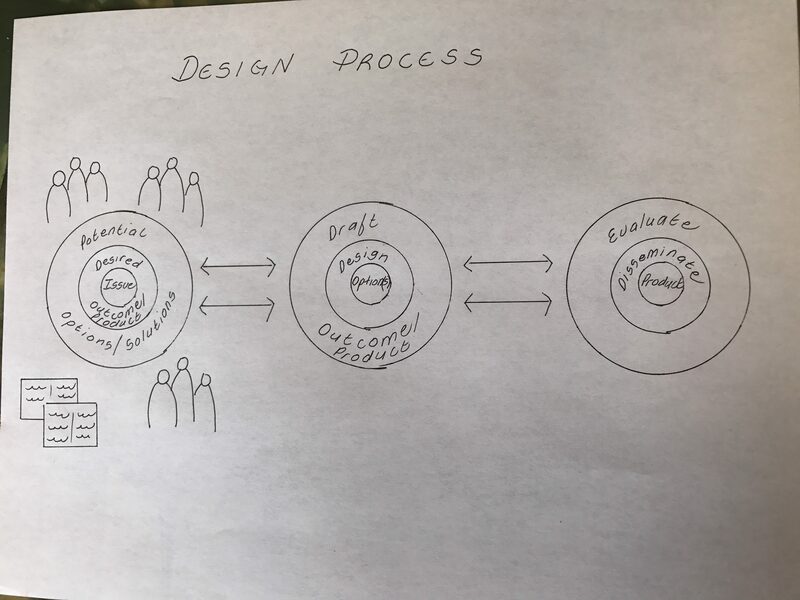 The design process that I have used relies extensively on the front end of the process in defining: the issue or problem at hand, the desired outcome or product to be achieved, and the potential options for reaching the desired outcome. Working in health care, we found it important to obtain input from many stakeholders involved, for example: end users (clients/patients and their family members/significant others); those individuals providing service to clients (managers, direct service providers, and physicians); community organizations linking with our clients and health services; unions involved in representing staff; and, in some cases, the public at large. Also important at the front end of the process was the necessity to review the literature pertinent to the issue at hand and to connect with other jurisdictions on what had been tried, and what had worked or not worked in addressing a similar issue. We started with arriving at a common, ideal vision for the end product and then brainstormed how we could achieve it. We then worked back to a more realistic outcome and plan of action. We found it did not work to leave end users or stakeholders out of the front end of the process. We also found it worked better to hold focus groups to obtain input from end users in an effort to obtain broader representation. In the middle phase, the more detailed, technical design process would begin, which entailed utilizing the expertise of architects and engineers in the facility design process or communications experts in the development of communication plans. A draft product would be arrived at and would then be shared and/or tested with the various stakeholders and end users involved to obtain their feedback and suggestions for improvement. Once the desired product was finalized, it would then be disseminated, and at the appropriate time, evaluated. The feedback obtained during the evaluation process would then be fed back to the designers, stakeholders and end users for further input, and if necessary, redesign.